Moses said to the people, "Do not fear, for God has come to test you, that the fear of him may be before you, that you may not sin. Adventurers understand the difference between "fear" and the "fear of" something. 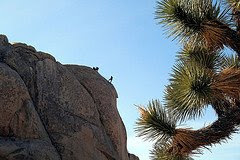 When a new rock climber begins initially climbing it is necessary to overcome one’s fear about heights, falling, and climbing in general. Caving into one’s "fear" means staying on the bottom and missing the spectacular view. And while the wobbly stomach at each ascent may or may not go away, a healthy "fear of" the rock, its impenetrableness, and the resulting possibilities should that "fear of" be taken for granted, should be constant. This "fear of" is what will help you reach the summit. Jesus, forgive me forthe fears that hold me. help get me to Your summit.